Jorge Dirkx was born in Leidschendam in the Netherlands in 1981. His work has been featured in The New York Times, De Standaard, De Morgen, Le Monde, The Moscow Times, Novaya Gazeta, Mo magazine and Knack. He has worked on projects including the Ebola outbreak in the Democratic Republic of the Congo and a disposable camera project featuring street kids in Moscow, Russia. He has exhibited throughout the world and has won several awards, including the Nikon Press Photo Award and Nikon Promising Young Photographer Award. Generally, when I find myself photographing an event it’s because I’ve been sent there by an agency or a magazine. However, the series of images I took in Egypt in 2011 – one of which you see here – was something I did off my own back. I’ve gone on several trips over the past few years when I haven’t had an assignment and I’ve been lucky enough to get the work published either during or after shooting the event. A lot of times when you are in a specific place with important or dramatic things happening, it’s easier to convince editors and get the work out there because they’re seeing the events as they’re unfolding. 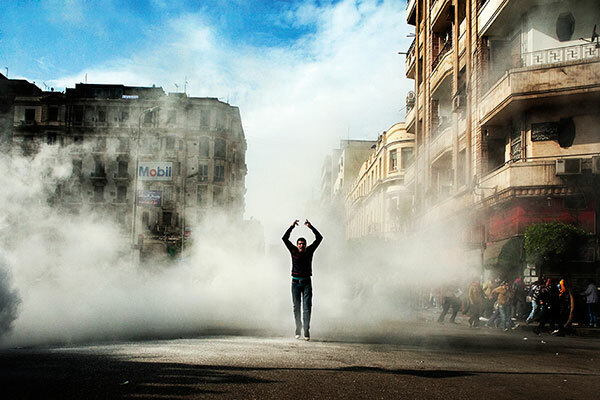 This image was taken during the revolution that grew out of the uprising in Egypt in 2011. It was an event that was seen around the world on television and in newspapers, but none of that could really convey what the atmosphere was like when you were in the middle of it. There was a lot going on: demonstrations, non-violent resistance, riots and strikes, all of which were perpetrated by people spread across a diverse socio-political spectrum. It was an incredible time. People had become tired of things like police brutality and political corruption. The image you see here was taken the day after I landed. I woke up in the morning and took a wander through the streets. I eventually ended up in the neighbourhood surrounding Tahrir Square in Cairo, an area that would go on to become a significant location during this time. I bumped into a journalist who informed me the protests would begin after the Friday prayers. I knew I had to be ready. I also had to anticipate the police’s reaction to the protesters and watch out for myself as I had been warned that journalists had been attacked and arrested by police. I was very much aware that I would run into trouble at some point. After the prayers, I followed a group of protesters who started walking towards the square. Suddenly, riot police started shooting teargas grenades to try to keep them out of the square. There was teargas everywhere but, incredibly, it seemed that the protesters were determined to stand their ground. This wasn’t the first demonstration in those troubled weeks and the protesters had become hardened. They knew what to expect and how to deal with it. The young man in the picture is gesturing to his fellow demonstrators and saying they should continue the protest. He’s telling them not to flee from the gas. Needless to say, the protesters didn’t go anywhere. At the time I shot the picture, most of the protesters were behind me. I suppose viewers can read the image as a symbol of the strength and perseverance of the Egyptian people. There’s a determination in the protester’s face and in his body language. However, I should say that all the things that have happened in Egypt over the past months and years can hardly be described in one image. When I took this particular shot, I was genuinely worried that a grenade would land on my head as they were flying very high through the air. Trying to guess where one would land, but still stay focused and shoot quality photographs, was incredibly difficult. I’m still amazed I managed it, although I’ve worked in crazy conditions before. I once shot an assignment in the Democratic Republic of the Congo during an Ebola epidemic. However, each experience is different and each has its own challenges. I shot this image using a Canon EOS 5D with a 24mm lens, although I’d usually shoot using a 28mm, 35mm or a 50mm lens. I always shoot using Canon cameras. I received my first film Canon camera some years back from a former Detroit Free Press editor. Since then, I’ve used only Canon equipment. The way the cameras are set up suits me, and in situations such as Egypt you obviously need equipment you’re comfortable with. The reason I wanted to shoot in Egypt was because I was particularly interested in what the result of such a large group of people demanding significant changes in their country would be. It fed into my desire as a photojournalist to provide proof and documentation of what is going on in the world. However, I must emphasise that while it’s important for global media to be able to focus in on stories like this, I’m a big supporter of local journalism. Those people have the ability to cover events for a longer period of time and get a better perspective and insight. This image won a few awards, such as third place in the War/Conflict Professional category at the 2011 International Photography Awards and the Nikon Press Photo Award. Winning awards is an opportunity for your work to be seen again by a broader audience. In most cases, the work will be published shortly after it’s made, and because of the high number of awards and grants that have been set up over the last ten years or so there’s another chance for the photographer to inform the public with his or her work. I think the most interesting awards are the ones that promote photojournalism in general and not just the winning image or photographer.